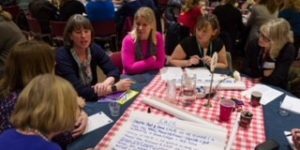 The new Parent Carer forum for Oxfordshire will be launching on 8 November at the OXFSN ‘Better Together Event’. The forum has been set up by a group of parents with children who have special education needs (SEN) to work with Oxfordshire County Council and the local NHS to help improve services for children with SEN.
As members of the National Network of Parent Carer Forum’s we will support the development of parent carer participation, a process in which parents work together with professionals to make improvements to local services. We believe that ‘Every Child Matters’ and that all disabled children and young people in Oxfordshire, should have access to the same opportunities, experiences and information , as any other child. Julia Stackhouse, Co-Chair of the Oxfordshire parent carer forum said ‘Our Vision is to be a well informed, connected and empowered community of families of children with disabilities or additional needs. We want to build links with as many informal and formal groups both those of parents and professionals so that we can work in partnership with health, education and social care to create quality services that meet the needs of all parent carers and their children/young people’. Stephanie Harrison, Co-Chair of the Oxfordshire parent carer forum added ‘If anyone has parental responsibility for a child or young person with additional needs or a disability, who is aged between birth and 25 years old and lives in Oxfordshire, please join us and share your experiences so that we can strive to improve services in Oxfordshire’. The forum and its representative will aim to provide reasoned feedback and support to professionals and ensure young people and their families are listened to. End. National network of parent carer forums: http://www.nnpcf.org.uk/ The National Network of Parent Carer Forums (NNPCF) is the independent national voice of parent carer forums. In partnership with OXFSN https://www.oxfsn.org.uk/ Oxfordshire Family Support Network (OxFSN) is a not-for-profit organisation run by and for family carers of people with learning disabilities – both children and adults.